Telephonic outreach helps to bridge the care divide, supporting and engaging vulnerable and high-risk populations. The optimal length of time to follow members to help manage and maintain life changes is one year, according to this new infographic from the Healthcare Intelligence Network. 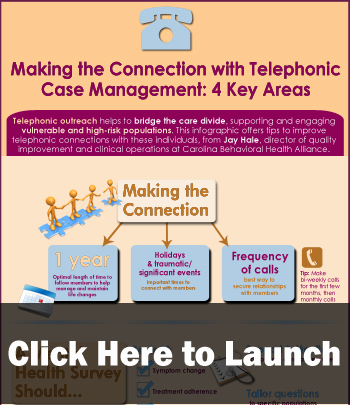 This HINfographic offers tips to improve telephonic connections with vulnerable individuals, from Jay Hale, director of quality improvement and clinical operations at Carolina Behavioral Health Alliance. It includes advice on how to connect with patients, identify warning signs, provide easy-to-use surveys, and develop qualities to become a successful telephonic case manager. The infographic is available for purchase as a downloadable Adobe Acrobat PDF file. Click here for details. Want more data on telephonic case management? Answer our “10 Questions” survey by May 31 to receive an executive summary of the results. You may also be interested in this related resource: Telephonic Case Management Protocols to Engage Vulnerable Populations. This 30-page resource describes a suite of tools to facilitate identification, interaction, surveys, follow-up action, resource matching, and member engagement and outreach for a behavioral health population that is also a template for case management and care coordination of any organization’s hard-to-reach or vulnerable members. This entry was posted on Monday, May 12th, 2014 at 1:30 pm	and is filed under Case Management, Health IT, Infographics, Telehealth & Telemedicine. You can follow any responses to this entry through the RSS 2.0 feed. Both comments and pings are currently closed.